The title of this book caught my eye. I’ve never seen the point of being exactly like everyone else. God made us all unique, one-of-a-kind humans, but most people spend their lifetime trying their best to be like everyone around them. They wear what everyone else wears, rush to the movie everyone is seeing, have cars and houses and yards that are amazingly similar, make sure their kids have the same toys, and repeat what others say. I began reading John Robison’s book with the idea that he would be detached and unemotional, perhaps depressed, a person frustrated with life. Instead, the author was articulate and downright witty in spots, expressing himself beautifully on paper. He has the same emotions and insecurities that we all have. The behavior of a person with Asperger’s Syndrome that is odd when described in other books, seems very understandable when John explains what was going through his head. 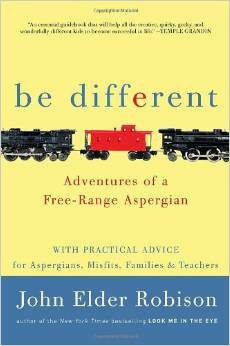 What I loved about this book was John’s point of view about Asperger’s. He doesn’t see it as a disability, but rather as a different type of brain wiring, and at times an advantage. He describes how he gradually taught himself to interact with others in a way that he doesn’t push them away. He also went on to start a successful business of his own. Whether you read this book because you have someone in your life with Asperger’s, or you just wanted to know more about it, you will be inspired by this biography. Touch sensitivity has its good points, but it can also bother me a lot, especially when I think about it. As I write this passage, my clothing is becoming increasingly noticeable. Sharp little fibers are biting into my back. The label on my shirt is scratching my neck. The more I think about it, the more I feel. Soon, I may have to tear all these clothes right off. Hopefully something will divert my attention before that happens, Otherwise, this shirt is headed for a bad end. But probably not. If this time is like most, some distraction will come along and my touch sensitivity will fade into the background. Today I meet moms who cut the labels out of their kids’ clothes and trim the seams. The first time I heard that, it sounded great. What a nice thing to do, I thought. But when I thought about things a little more, I began to question the wisdom of that. Why? Because removing the irritants doesn’t do anything to decrease our sensitivity. And if clothes tags bother us today, and we don’t address the nuisance head-on, where will we be in ten years? Naked at work? Instead of fixing my clothes, I fixed myself. I learned to focus my mind so that my sense of touch no longer controlled me.